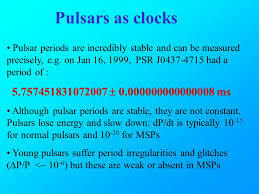 I find it outrageous that pulsar JO437-4715 rotates at 173.7Hz. This is a star almost twice as massive as our sun, whipping itself around, a full rotation every 5.75ms. What’s the fastest you can spin yourself round? I’m guessing it’s a lot less than 174Hz and you’re considerably smaller than JO437-4715. I dunno. Astrophysics is more fantastic than most fiction I read.